Only the best for every occasion. Birthdays, christenings, communion, confirmations, festive dinners, corporate events. As your hosts, we are available for your celebrations at any time. We have rooms to suit every kind of celebration. The ‘Fireside Room’ in elegant English style with fireplace, marble and parquet can accommodate up to 70 wedding guests. Our ‘Marie-Louise’ ballroom in original empire rococo style, makes a stylish highlight for every great wedding party. 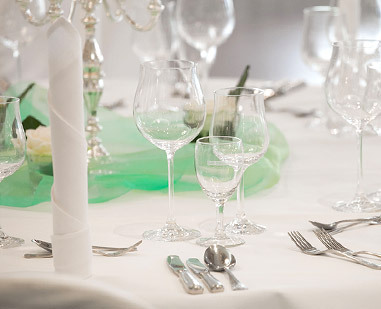 The ballroom is fully air conditioned and provides seating for up to 120 guests. Our traditional restaurant with its clay stove can hold celebrations for up to 40 guests and can be prepared for each party in a traditional or modern, but always festive theme.